A novel class of Mn(III) and Fe(III) complexes of L-tyrosine-based ligand has been synthesized and characterized through various analytical and spectroscopic techniques. These complexes were found to exhibit efficient binding properties with the biomolecules viz. calf thymus DNA and BSA. The ability of complexes to bind with such biomolecules has been explored through absorption, emission and viscosity measurements. Based on spectroscopic techniques we can conclude that the complexes could bind to DNA via intercalation. It was observed that these complexes can cleave pBR322 DNA in gel-electrophoresis technique through oxidative mechanism. The BSA was quenched by the complexes around 340 nm adopting a mechanism of static mode. The binding constants, thermodynamic parameters and the donor to acceptor distance were calculated. Besides, molecular docking simulations were carried out for the complexes with human DNA topoisomerase and BSA protein. 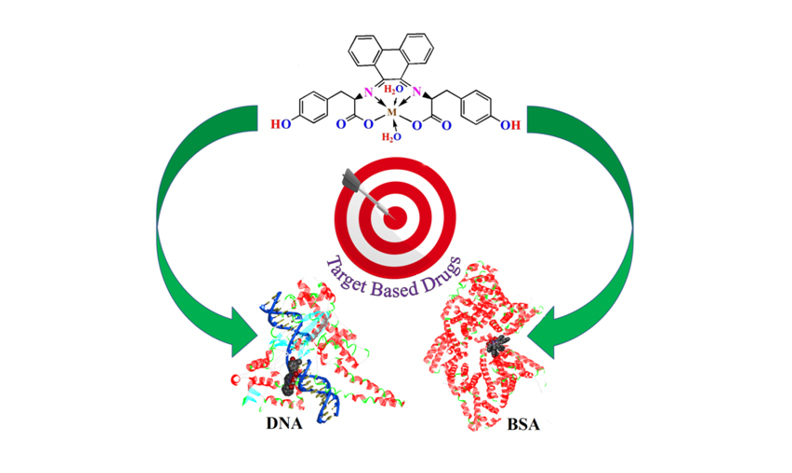 The docked poses are visualized to provide supportive evidence to the interaction of the synthesized complexes with DNA/BSA.